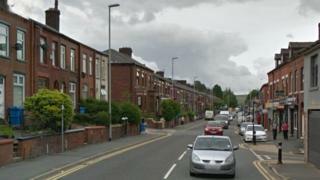 A van driver has died after crashing into some houses, Greater Manchester Police have said. Officers said they received reports before 05:45 BST of the collision in Lees Road, Oldham. The 27-year-old driver died while another man, aged 19, has been taken to hospital with injuries. Sgt Lee Westhead said police were working to "uncover how this happened" and appealed for anyone with information to get in touch.